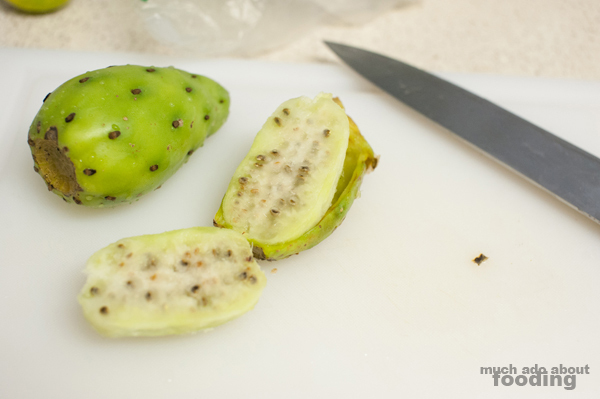 I think alcohol was on the minds of the suggesters when the green cactus pear came up as the Test Kitchen ingredient last week. Margaritas were suggestions but we didn't have the ingredients on hand for those. Additionally, a lot of cactus pear drink users take advantage of the red cactus pears (also known as prickly pears) for their gorgeous, deep fuschia color inside but ours was of the green variety. A brilliant color wasn't available through these to shine through in a margarita but...what about a refreshing glass of agua fresca? 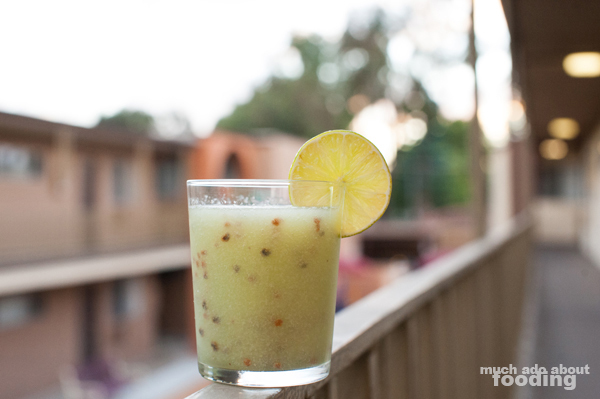 It's been hot enough to warrant a pulpy glass of "cool." Try your hand at the recipe below. If you want more than one serving, scale upward in ingredients accordingly. If you bought the pears from somewhere, they should have already removed the prickly parts on the skin. If not, be careful! The skin is easy to peel off once you slice the pear open - just pull it off and discard. Puree the pear together with sugar. 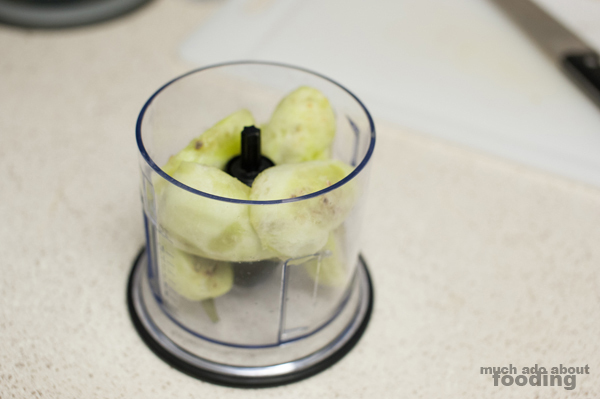 You may need to do it in batches depending on your quantity and size of the food processor. For this particular recipe, I only made enough for one so one go in a small processor was fine but for larger quantities, make sure to combine accordingly. If you don't like seeds, strain juice through a fine mesh sieve. If you don't mind, have it altogether! 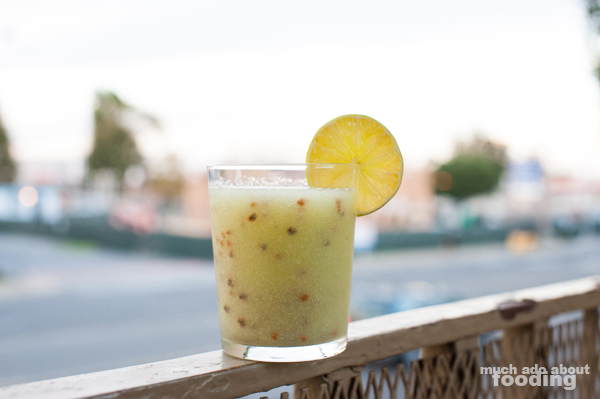 We suggest chilling the agua fresca before consuming for best experience. Enjoy the natural sweetness of the pears. 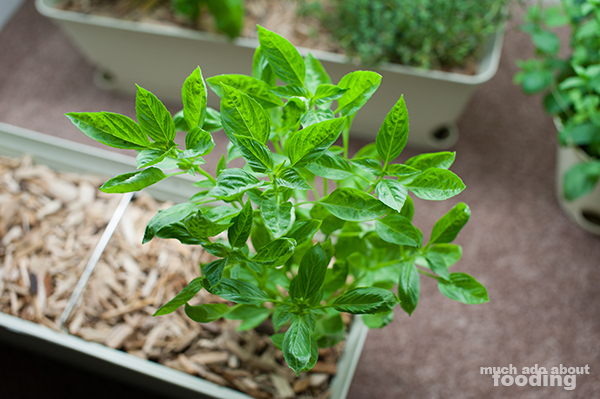 Duc's Thai basil is almost ready for a small harvest! We're so excited for this one because it has a different type of fragrance from typical sweet basil that we love as well. The funny story about this plant is that we started it from one of those sprigs offered with the meal in a pho restaurant. We took it home, started the rooting, and then planted it. Voila - a full plant of our own! So let us know what you think we should do with our basil baby next week. Comment when the picture comes up on Facebook. Thanks! This sounds soo good. I will have to try this!